Can’t choose between a bounce house or a fun inflatable slide for your next party or event in Lafayette? At Bounce E Bounce, LLC, this is never a problem! 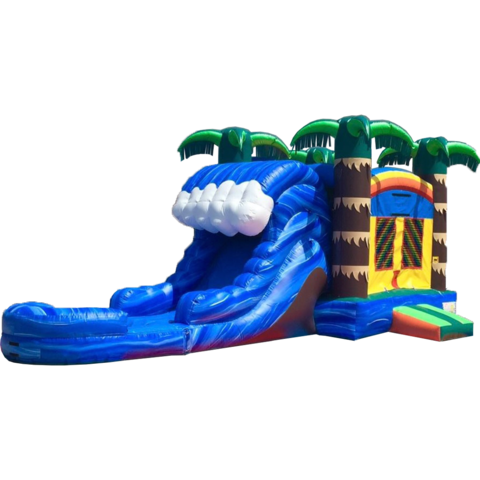 The Tropical Wave Combo (Dry) is just one of the combo units that you’ll find in our collection of inflatables. This unit combines two awesome attractions in one! On one side, you have a roomy bounce house that is outfitted to look like a tropical paradise, inflatable palm trees and all! On the other side, there’s an attached slide that is reminiscent of rushing rapids and features vibrant hues of blue! Provide your guests with an awesome, unforgettable party experience and treat them to the Tropical Wave Combo (Dry) during your upcoming party or event! At Bounce E Bounce, LLC, we deliver all across Acadia Parish, and can guarantee on-time delivery and setup with every single order! Book the Tropical Wave Combo (Dry) via our online reservation system today!